This is the third and final installment of the So You Want to be a Business Analyst…Or Perhaps You Already Are series. Part One discusses the role of a business analyst with Part Two focusing on a better understanding of when you play both roles and determining where you may lean given your capacity and skills. In this third part will explore how to pursue your career as a business analyst. You are what you do and not your job title. If you do business analysis then you are a business analyst. Maybe your job title is project manager, technical writer, program manager, product consultant. It does not matter. My first six-years in the project world I held the working title of “product manager” and job classification of “state financial consultant”. You will find this work listed as “business analyst/product manager” on my résumé and LinkedIn profile. “Business analyst” is industry standard for the work done and provides a commonality across organizations. What does your résumé say about you and the jobs you have held? Give your résumé a hard look and find those tasks and deliverables that you have listed that fit under the category of ‘analysis’. 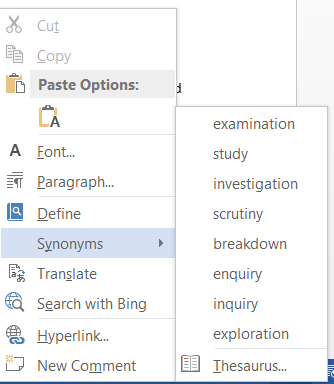 Try this – type the word “analysis” in Word and then right-click to view synonyms. Let me help you out with a picture of the results I get. Use these words as a guide in reviewing your résumé. Take this a step further. What missing from your résumé? Think about the work you have done and what you can add that lends weight to this aspect of your experience. I have provided further guidance on documenting your experience in my article, Document Your Project History. Remember to update your LinkedIn profile as well. Use the Skills section of the profile to highlight this experience and ask connections to “endorse” these skills. Nothing speaks more to your professional aspirations and commitment then involvement in a professional organization. Not only does it look good for you, but you gain the benefit of a network of peers in comparable roles to learn from and share experiences with. There are varying levels of involvement and added benefits come from each. At this level you will have access to an electronic copy of A Guide to the Business Analysis Body of Knowledge (BABOK®), a subscription to The Connection newsletter, and a wealth of resources online including articles, discussion groups, webinars, and tools. Meetings and workshop will increase your exposure to best practices and make sure continued education in business analysis topics. This further demonstrates your commitment to the profession as well as your own professional development. You will also build your local network of business analysts that can help you through struggles you have on the job in your next career move. Volunteering is hugely fulfilling and beneficial to your career. It takes you from to the next level as far as demonstrating your passion for business analysis as a profession. It provides opportunity to show your work to other business analysts and build a reputation as a professional. Those who volunteer for my Chapter will find a ready referral and reference from me as they pursue future opportunities. This may be volunteering on a committee, with a specific task, for a project, or as a board member. Volunteer positions tend to be what you make of them and a lot can be accomplished in a few short hours a month. Don’t forget to put your volunteer activities on your résumé and LinkedIn profile. Step 4 – Get certified! The time, effort, and money you put into the certification process exhibits your commitment to being a business analyst professional. You must prove earlier experience to sit for the exams. You must learn, keep, and prove you have a significant amount of knowledge on business analysis best practices from Enterprise Analysis to Solution Verification to pass the exam. Apply what you know in the real world and this step will take you far. I hope this series has provided some helpful information as you pursue your career in business analysis. Please feel free to contact me (vicki@project-pro.us) for more information or guidance. Follow this blog to get receive alerts of future posts that will be of interest to you. Part 2 – Are you a business analyst? As the Seattle Chapter President of the International Institute of Business Analysis (IIBA®), I often get questions about how someone can learn more about becoming a business analyst. Often times those asking have been doing business analysis work realizing it for some time; only they have not yet realized it. This three-part series is to help you understand what business analysis is (part 1), how to know if you are a business analyst at heart (part 2), and offer the first steps to advancing your career as a business analysis professional (part 3). The following two lists offer some more context to “tasks and techniques” by listing tools used and items developed and delivered by the business analyst as documented in the BABOK®. These lists show that many roles do business analysis activities and deliver business analyst results. Some common project roles include data analyst, project manager, technical writer, and developer. 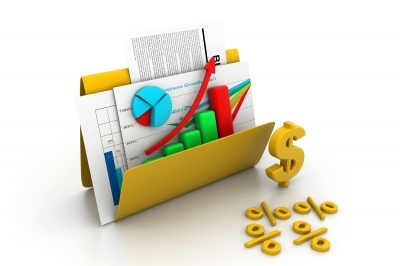 Many people do “business analysis.” So what is a business analysis professional? The project manager, developer, and data analyst may use some tools and deliver some of the same results as the BA as it relates to their specific role. A business analysis professional works with all the business analysis tools and techniques to deliver work that supports defining, managing, and evaluation the solution or resulting product (“to recommend solutions that enable to the organization to achieve its goals”.) The project manager, data analyst, technical writer, or developer rely on the work of the business analysis to provide clarity on the solution and allow project work to focus on steps needed to most efficiently deliver the desired result. The business analyst is responsible for defining is what will bring value to the business, ensuring the requirements are fully vetted and understood, and that the solution meets these expectations. This allows the project manager for focus on the project process, progress, team, risks, and all those other aspects that make project management a full-time job. Read more on this in The Project Manager vs. the Business Analyst. Further, the business analyst frees the technical people up to design and build the solution to meet the need the first time. You likely play a combination of roles if you are reading this article. Next week we will discuss how to know what you are when you wear multiple hats. Find out if you are a BA at heart in Part 2. 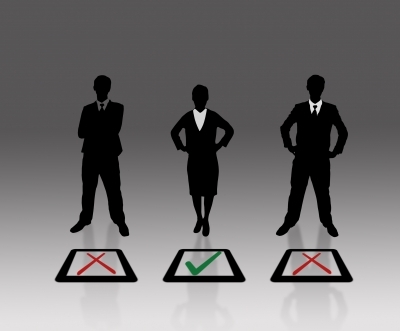 The role of business analyst falls under many job descriptions. I talk to people all time that are business analysts, only they don’t know it. Maybe the have the job title of “technical writer” or “program manager”, but in reality, they are analyzing the business. Here are some signs you might be a business analyst.. If while standing in a single line you count the people in front of you and divide by the number of cashiers serving customers to figure estimated waiting time..
Do you want to join in the conversation? Visit the Business Analysis Times LinkedIn group!